Northern New England, a rugged landscape dotted with transient settlements, posed challenges to the traditional town church in the wake of the American Revolution. Using the methods of spatial geography, Shelby M. Balik examines how migrants adapted their understanding of religious community and spiritual space to survive in the harsh physical surroundings of the region. 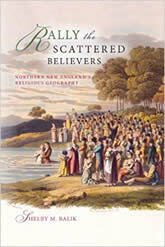 The notions of boundaries, place, and identity they developed became the basis for spreading New England’s deeply rooted spiritual culture, even as it opened the way to a new evangelical age.